The Schoodic National Scenic Byway has an abundance of picturesque coastal Maine villages. After some touring, an outdoor adventure, or stops at scenic turnouts, chart a course for one of the downtowns. Hancock, Sullivan, Winter Harbor and Prospect Harbor are where you will find stores, restaurants, restrooms and the classic local post office. 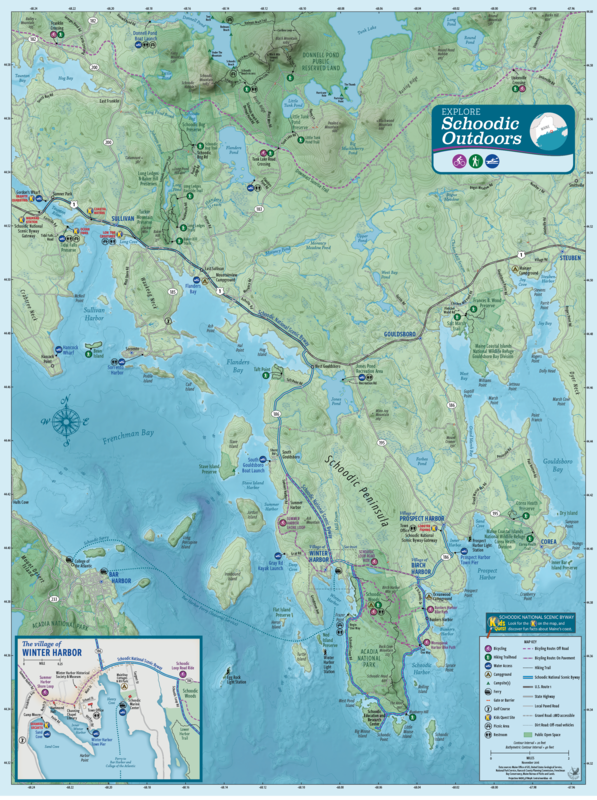 Stop at a village business or visit a town office to pick up a “Schoodic Outdoors” map, discover local events, find landmarks, or learn where the local fishing fleet sells their lobsters. Remember to ask about waterfront access points – usually within walking distance. All along the Byway, including the smaller villages of Bunkers Harbor, Birch Harbor, and West Gouldsboro, it is easy to find locally grown and locally fished foods at restaurants and seafood shacks, or at small groceries to take home and prepare. Look for blueberries and other produce, and of course catch-of-the-day Maine lobster, fresh fish, clams, mussels, smoked fish and even pickled wrinkles – (ask a local). The Schoodic area offers accommodations to suit everyone. You can find a place with the smell of the ocean and starry night sky from your RV or tent, or a cozy oceanview cottage, or a quiet inn with top-notch service. Whether you’re interested in souvenirs and mementos, handmade artisan crafts, antiques, coastal- themed home goods, or collecting fine art, the shopping experience along the Schoodic Byway is unique and fulfilling. A special Schoodic shopping experience is one of the best things this place offers. Step into a store on main street or drive into a hidden gallery off of the beaten path for some shopping fun – you might even find something money can’t buy – a new friendship. Since you opted for the uncrowded, unspoiled rural experience on the Schoodic National Scenic Byway, one of the best places to take break, get local information and find a restroom is at a town office. The small, friendly municipal offices in Sullivan, Gouldsboro (Prospect Harbor Village), and Winter Harbor are the next best thing to visitor centers and they are located near the great Byway spots. Schoodic area locals hold lots of fun events that are open to the public. Plan your visit around one, or check with a local business to see if there is an event while you are out on the Byway. To find dates for the annual events: Sullivan Daze, Winter Harbor Lobster Festival, and Schoodic Arts for All Summer Festival, take a peek at the Chamber of Commerce calendar. Explore the Schoodic National Scenic Byway in its entirety with two things in mind: Spotting coastal Maine bird species and enjoying great water views. Binoculars are ideal but not essential! Except for the 1.3 mile round-trip walk on the Old Pond Railway Trail all of the sites are small and reachable by car. At each site, you can walk a short distance to get closer to the water and explore different habitat types. You can choose to do the whole thing in a day or break it into two half days. Sand Cove in Winter Harbor is the midway point if you decide to call it a half-day adventure. Old Pond Railway Trail: Hancock, ME. Park at the trailhead on Point Road across from the Hancock Town Office. Then head .6 mile down the path to the old rail bridge. Look for wading and shorebirds among the wooded tidal flats. Tidal Falls: Hancock, ME. Look for the sign on Route 1 and then turn right on East Side Road just before the Hancock-Sullivan Bridge. Head ¾-mile down to Tidal Falls Road and turn left. The Tidal Falls site is at the end. Look for gulls, eider ducks, ospreys and bald eagles all around the reversing falls area and in the small cove to the south. Long Cove Rest Area: Sullivan, ME. Look for the restroom and small paved area with interpretive signs on the south side of Route 1, a short distance after you go over the Hancock-Sullivan Bridge. There are great water views at any tide here. Walk to the shore and the exposed rocks on both sides of the point to see shore birds and osprey. Check the trees along the shore for interesting songbirds while you’re there. Sand Cove at Camp Moore: Winter Harbor, ME. Heading east out of Winter Harbor village turn left on Beach Street and proceed .1 mile to the Camp Moore sign on the left. Sand Cove will be right in front of you. To access the water, walk down the dirt road to the red camp building or go straight across the grass down to the shore. The views out to the ocean are breathtaking and you are likely to see several types of ducks, wading and shorebirds, gulls and terns, plus osprey overhead. Frazer Point Picnic Area: Along the Park Loop Road. Open waters to the west and tidal waters to the east of the point both provide great views where you’ll see a variety of water birds. Sit out on the seasonal boat dock or wander along the rocky shore to find the perfect spot. Blueberry Hill Scenic Turnout: Along the Park Loop Road. Just north of the Schoodic Point signs, head for the Blueberry Hill parking area on the ocean side. Once there, walk to the shore to see eiders, guillemots, gulls and other ocean birds. Enjoy bold, rocky coast views at this great site. There are a few walking paths on either side to find your own personal oceanfront birding and viewing spot. Dorcas Library Property: Prospect Harbor, ME. At the intersection of Routes 195 and 186, this village library property is a haven for water birds. Park in front of the library or at the Town Park across the street and then head out behind the library. Outback, you will find Watering Cove and probably a mix of bird species, depending on the tides. A great way to explore the Schoodic National Scenic Byway is through its many shops and stores. There are no shopping centers so you’ll have to drive, bike, or walk the coastal scenery to discover the Byway’s places of commerce. Treasures are sold out of the historic buildings, roadside shacks, cottage style houses, barns, and even gardens. In the village centers and along the side roads of the Byway, you’re likely to find a special item to treasure, or local seafood to bring home, or simply a story about this place while chatting with the store keepers.